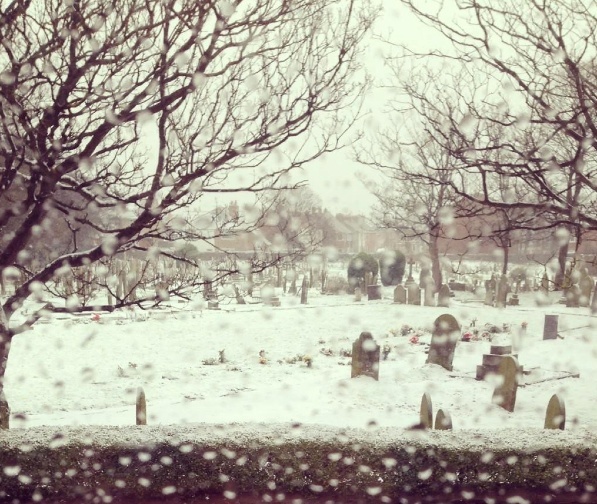 Unless you knew Hoylake well or had reason to go there, you’d never know that Hoylake Cemetery existed. Down Trinity Road and on the site of the former Hoylake Parish Church, the cemetery offers a glimpse into Hoylake’s rich past. Even if you’ve no reason to, you should visit it and read some of the gravestones …it’s something I intend to do this year. I’d seen a couple of photos of the cemetery and as I was walking home late on Friday afternoon I took a diversion up Trinity Road. 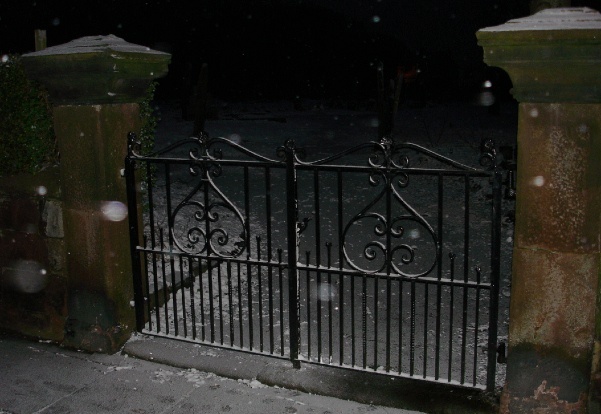 It was too dark really and the few snaps I took failed to show anything …but I like the one above of the gates. These are the gates that were restored about three years ago and the comments in this original post talk about a secret tunnel! If you look carefully there are 3 white war graves and an Open winner! One of my relatives is buried there, I don’t visit as much as I should, but have done a few times over the last 10 years.Still not found the grave, I think it may have been a ‘double burial’. The rumors of a secret tunnel sound interesting, its quite likely one exists as there are rumors of a tunnel from the White Lion pub in West Kirby to Hilbre Island, that monks used. Hello..in the 50s I used to go Holy Trinity Church and when I was at the Infant school on School Lane I think it was..some of us, presumably with friends and parents used to take a short cut through the church yard to get to the back of the school. I am not sure whether there was a back gate or that we used to shin over the wall.!! I visited the cemetry a couple of years ago to find my Mother’s grave ..she died in 1956 when I was 11 so it is all a bit hazy, but I agree with the photographer that it is a fascinating glimpse into Hoylake’s past. I have a feeling that there is a V.C. buried there. You are quite correct. Lt John O’Neill Is buried between the two main gates. He was serving as a Sgt with 2nd Leinster Regt In WW1 when the battalion was pinned down by a German machine gun position. John, another Sgt and 12 men attacked the enemy position putting them to flight. They captured the position and a number of weapons, including field guns which they turned around and fired upon their previous owners. They held the position for 48 hours for which John O’Niell was awarded the Victoria Cross. After WW1 we find him, somehow, serving as a SGT Armourer with the new RAF alongside Aircraftman Evans, who turned out to be no less that Lawrence of Arabia and, upon this he was discharged from the RAF.. O’Neill was appointed Lt with the Pioneer Company based at Hoylake (what are now the Army Cadet Forces HQ) providing armed duties on Liverpool Docks when he suffered a Heart attack and died. He was buried with full military Honours in Hoylake Churchyard but his grave was largely forgotten until a group realised the importance of his grave and improved it. Royal; British Legion Moreton have agreed that they will commemorate his award on two occasions each year. there are some of my relatives buried in the church yard, Brosters, It is such a shame that so many of the old headstones are down on the ground it makes it difficult to find more of your relatives. I wonder if there could be a big clean up and try to uncover the lost family headstones and stand them up. Are there any strong men out there. Sheila, you are correct. It is Lt John O’Neill VC, MM who served as a Sergeant in the First World War with the 2nd Bn Leinster Regiment. For most conspicuous bravery and devotion to duty near Moorseele on 14th October 1918, when the advance of his company was checked by two machine guns and an enemy field battery firing over open sights. At the head of eleven men only he charged the battery, capturing four field guns, two machine guns and sixteen prisoners. Again, on the morning of the 20th October 1918, Sgt. O’Neill, with one man, rushed an enemy machine-gun position, routing about 100 enemy and causing many casualties. Throughout the operations he displayed the most remarkable courage and powers of leadership. He later served as a Sgt Armourer with the RAF alongside Lawrence of Arabia, until Lawrence’s real identity was discovered and he was promptly discharged. During WW 2 John O’Neill served with the Pioneer Corps at Hoylake providing security Guards in Liverpool Docks. He died of a heart attack on 16th October 1942. Unfortunately his grave was largely over looked and overgrown until it was uncovered and re-dedicated in 2005. It is positioned exactly midway between the two gates and close to the Trinity Road wall. It is the intention of Moreton Branch of the Royal British Legion that his grave will be visited, kept tidy and a wreath laid every year. There are also about ten other Armed Forces graves in this cemetery. Can I ask what is meant by Armed Forces graves, because there are a lot of men buried here who fought in both world wars. Armed Forces War Graves are those graves of persons who were serving in the armed forces of those country when they lost their lives, At a recent check there were 12 Armed Forces Graves in Holy Trinity graveyard, mainly from Royal Navy or Merchant Navy but there were others. Most of the gravestones are of uniform design and wording and are scattered throughout the churchyard. Armed Forces Graves are graves of armed forces personnel of Royal & Merchant Navy, Royal Marines, Army and RAF who lost their lives while serving their country. If you look at the grave stones they are almost all of the same design with a rounded top and carry the badge of the persons service as well as their service number, rank and name and the date of the death. These stones were erected by the Imperial (Later Commonwealth) War Graves Commission. I TOO HAVE LOTS OF RELATIVES IN THIS GRAVEYARD- ECCLES-SHERLOCKS-ARMATAGE. West Kirby Family History Society hold a copy of the memorial inscriptions for Holy Trinity, Hoylake. These were transcribed a few years ago by enthusiastic members of the group. There is also a copy held at West Kirby Library. If anyone has enough of the History to run a tour of the Cemetary i am sure it would be a popular event. Hi can anyone who went to school lane infants school in the 1940/1950 period remember having their school dinners at the old vicarage in trinity road and as you walked in through in the gates into the vicarage grounds there was a big canon and a large anchor,I often wonder is this the anchor that is outside the Blue Anchor pub. John, you are now living in the same part of Ontario as several of my wife’s relatives. They are of Guyana decent and their family name is Williams. eg. Truman Williams in your area, though much of the rest is around the Toronto area. The West Kirby Family History Society produced a reference guide to the memorial inscriptions and description of the gravestones a few years ago. This was collated by several enthusiastic members of the group. A copy can be consulted at West Kirby Library. Desperately sorry but I attended the Infants School but the only thing that I can remember was my walking home along the lane at the back of father standing at the end of that lane at the back of Ferndale Road on 9th February 1944 to tell me that was on l;eave from the army and that I had a baby sister. At the age of 7 I’d much rather have had a decent butty. I live in the States but would love to someday visit this beautiful cemetery. Can anyone tell me if there is a gravestone for a Samuel Joseph Davies, who was buried there 27 July 1918. If so, would there be anyway to get a photo emailed to me? West Kirby Family History Society has transcribed all the readable stones in Hoylake Cemetery, There is a copy ar Hoylake Library and also Birkenhead Ref. The group holds a Help Desk 2nd Friday in the month at Hoylake Library if anyone wants a look-up we will do it for you. There is a sandstone kerbstone in Hoylake Churchyard. “In loving memory of Samuel J Davies who died 25th July 1918 age 57 years. Thank you Maureen. Is it possible to see if his wife is buried there as well? her name was Eleanor Agnes Tallon Davies, but I have no idea when she passed. Is there anyway to get a photo of this grave? 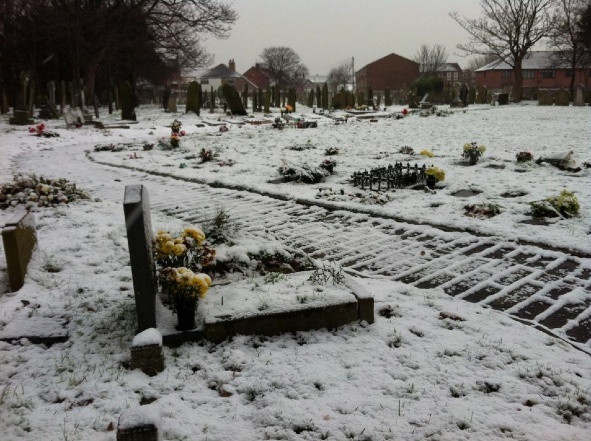 I have checked the MI’s for Eleanor Agnes but drawn a blank as to her burial in Hoylake Churchyard. In 1901 the family were living in Hazel Road Hoylake. and there is no mention in the 1911 census – although this was only a very quick search. As ahe was born in Windermere it’s possible she went back there to live after Samuel’s death. Although there is a memorial kerb in the cemetery it may mean that it is only a memorial and not where he is buried. Did he serve in the Great War? I will have to wait for some fine and less muddy weather to see if I can spot the memorial. Does anyone know who to contact for information on family graves in Trinity Cemetary? I have visited the graveyard many times as I found my grandmothers, and great grandparents shared grave about five years ago by chance…. I would love to know if there are any other family members there too. I’m currently researching our family tree, if anyone knows the Taylor family in Hoylake? My dad was Billy, his siblings were Joan, Les and Alan and his mother in the graveyard is Miriam Jane Taylor and her parents were Samuel Taylor and Mary Jane Taylor nee Banks. Miriam lived with her 4 children in a terraced cottage behind the Plasterers arms, but her family lived in Elm Terrace. Hi there, I went to this cemetery a few days ago and discovered a mystery grave of a J G Swainson, I am a descendant of the Swainson Family. My ancestor, John Timothy Swainson, his wife Betty donated the Holy Trinity Church and land. I was unable to further research who this mystery grave belongs to due to only having a few hours free to be here. If anyone knows any other information or may know who this is it would be a huge help.. i will keep looking but so far this person is missing in my family tree. The grave is that of Isaac Gabriel Swainson (1794-1855) son of John Timothy Swainson and Betty Hammerton. Isaac was for many years Collector of Customs in Jamaica. He married twice – but his first marriage to Elizabeth Stewart was not a success and they lived apart, with Isaac in Jamaica and Elizabeth in Surrey. He had six children by his second wife Charlotte Parker, all born in Jamaica. I have not been able to find out why Isaac was in England at the time of his death – unless it was just to visit relatives. I am also a descendant of this Swainson clan – but a different branch..
My relatives the Aldreds are buried here.Robert was a building contractor ,built houses in Hoylake and served as an alderman on the council.